From the first resounding chords a flood of emotion flowed through Havah like a river current. In a moment she was both callow child, alive with anticipation, and wizened matron, bone weary and full of years. Her mother’s voice lulled and comforted her with a song about raisins and almonds. She saw her father’s face, half illuminated by candle flame as he poured over volume after volume of Talmud. Arel approached from the shadows, tall and thin. His gray eyes devoured her. His tender lips kissed her. Frederic Chopin’s Nocturne in C Sharp Minor soothed Havah’s jangled nerves. The ivory keys were smooth and comforting under her fingertips. Although she would never be a pianist of Ulrich’s caliber she played well enough to entertain an audience of one. Closing her eyes, she relished a soft breeze carrying the scents of daffodil and hyacinth through the open window. Letting the strains of Chopin’s Nocturne in C-Sharp Minor waft over her, Shayndel sat in the rocking chair beside the piano with Tikvah asleep on her lap. While Shayndel did not know many musical pieces by name like her sister-in-law she could always recognize this one. When Havah was sad or in pain this would be the piece she chose to play. While not a person or an animal, a piece of classical music becomes something of a friend and companion to Havah. Chopin’s Nocturne in C-Sharp Minor comforts her when reality becomes too much to handle. I fell in love with this piece and Chopin’s music when I saw the movie The Pianist. It’s haunting, ethereal beauty transports this author to other places so it seemed only natural it would do the same for Havah. Unlike the author, Havah has latent musical talent that Ulrich is only too happy to nurture. While he tries to steer her to something simpler for a beginner, she is determined to learn how to play the nocturne. I hope you’ll take the time to not only read my excerpts but also to enjoy the music. Out of the corner of her eye she [Havah] saw her mother creep through the doorway and inch toward the bed with a wooden rolling pin high over her head. She slammed it down on the back of the man’s head. With a sudden jerk and a grunt he released Havah. He rolled off her and fell to the floor unconscious. She sat up, clutching a pillow and stared down at him. Blood pooled under his head and seeped into the cracks between the floor boards. This had to be a dream. In the morning Papa would wink at her over breakfast and assure her it had all been a horrendous nightmare. Her mother yanked her hand, dragged her from the bed and held her for a moment, her tears hot on Havah’s neck. “Hurry, Havah. May the God of Israel go with you.” Taking Havah’s face between her hands her mother kissed her forehead. Heart thumping, she ran. Thick smoke stung her eyes and burned her throat. She stopped and turned to look one last time. The blazing synagogue crumbled to the ground. The Heder teacher’s face turned crimson. He narrowed his eyes and glared at five-year-old Havah as if she were a piglet about to be dumped on his doorstep. Then he clenched his tobacco-stained teeth and spat a brown glob on the doorstep. Up until this moment she had been excited to learn to read the Torah, the words that came from Adoshem’s own mouth. Huddled against Papa’s shoulder she hid her eyes in his coat folds. Until the pogrom that took them from her, Havah’s parents, Rabbi Shimon and Miriam Cohen were the two most important people her life. Not one to be bound by law and traditions, Rabbi Cohen relied more on Torah than Midrash, the rabbinic commentaries. When questioned, he was quick to argue that the former was the irrefutable word of God while the latter was merely opinion and conjecture. He encouraged his daughter and his wife, if they so desired, to study the Holy Word. Miriam was a gentle and loving wife who kept a clean, Kosher home. She considered her greatest treasures to be her husband, her two sons and her daughter. Havah adored her parents and her memories of them are a constant thread throughout the series. Even though she was only sixteen when they died, their words of wisdom are always there to guide her. Although she [Havah] had dusted it many times, a faded photograph in a silver frame caught her attention. A woman with pale curls around her face smiled at her from under a lace bridal veil. She lifted the picture from the table beside the piano. Not waiting for an answer, he continued. His spirit seemed to travel to a distant time and place. Tears shimmered in his eyes. “Valerica Dietrich. She was always the picture of fashion. But, if you ask me, she could’ve worn flour sacks and still have turned heads. It was for his Romanian wife, Valerica that Ulrich moved to Kishinev, Moldova. Her death in childbirth dealt him a terrible blow from which he has never recovered. 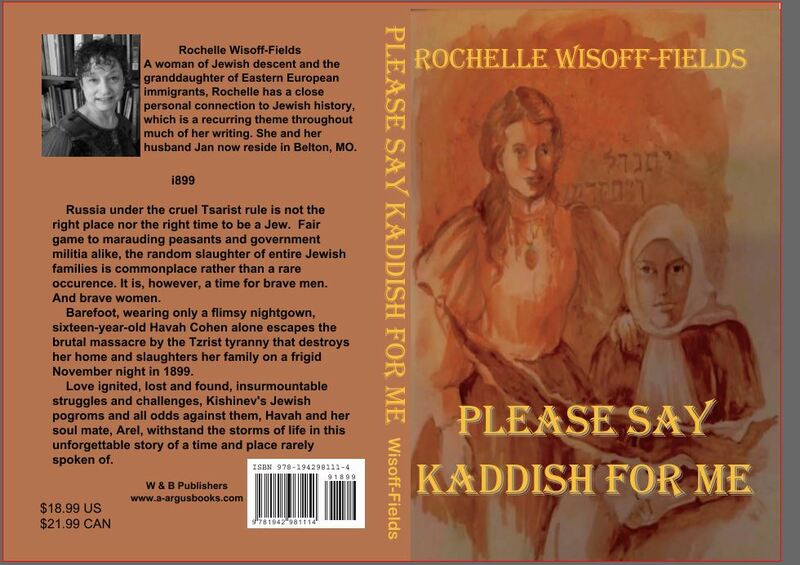 In Please Say Kaddish for Me, to keep her memory alive, Ulrich still has all of her belongings and refuses to sell the house they shared. However, after experiencing anti-Semitic oppression and the carnage of the pogrom, he can no longer bear to remain in Kishinev. Picking up a letter from his desk, Ulrich held it to his nose and breathed in the aroma of rose water. He pictured Havah sitting at the kitchen table, pen in hand, munching raisins, black waves cascading over her shoulders. “Here, I’ll read it to you. I am hoping happiness for you. You, above all people, deserve it. For a moment he stopped to study her even letters. The memory of her battle with her knife-slashed hand still pained him. No longer able to perform simple tasks such as writing or even holding a spoon, she forced her left hand, with unyielding diligence, into submission. After all of that, she still had impeccable penmanship. Following tearful goodbyes to Ulrich and Nikolai, Arel, Havah and Arel’s family immigrated to Kansas City. Ulrich, who had already secured a teaching position at the Royal Academy of Music in London, talked Nikolai into joining him. At the beginning of From Silt and Ashes Havah maintains her friendship with Ulrich through letters. Thanks to Arel’s income as a tailor, Arel and Havah have purchased a new house and are adapting to American life as they anticipate the birth of their first child. Although she’s comfortable in her new home, Havah suffers from Post-Traumatic Stress and worsening physical disability. No longer an adolescent, she’s a young married woman who faces challenge after challenge with tenacity and courage.